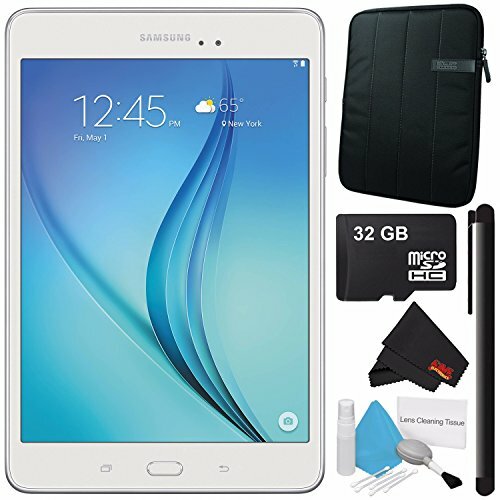 Stay informed and entertained with the white Samsung 8.0" Galaxy Tab A Tablet. For power and multi-tasking, this tablet has a 1.2 GHz quad-core processor and 1.5GB of RAM. It features a 16GB storage capacity and also has a microSD slot for additional storage; the microSD slot supports microSDXC cards up to 128GB. For high-speed Internet connectivity, 802.11a/b/g/n dual-band Wi-Fi is built-in. Bluetooth 4.1 connectivity is also integrated for wireless pairing with devices such as headphones. This device also features GPS with GLONASS, which allows you to use Google's location-based services. The Galaxy Tab A is endowed with a 8.0" TFT multi-touch display and features an XGA 1024 x 768 native resolution for viewing HD content. The onboard front-facing 2 megapixel and rear 5 megapixel cameras allow you take pictures of yourself and the world around you with up to 4x digital zoom. A micro-USB 2.0 interface is onboard for charging the device; a USB cable and charger are included. The integrated 4200mAh battery is designed to offer hours of enjoyment before recharging is needed. The Galaxy Tab A comes with the Android 5.0 Lollipop operating system, designed for fluid and intuitive multi-touch navigation.